This Book seems so obvious and inherent, but it actually breaks new ground. James Collins furthers a concept that most certainly is NOT in vogue … ”Followership.” The very word “Follow” has a bad rep, but there can be NO Leaders or business success unless there are those who know how to effectively FOLLOW (i.e. support, challenge & execute the Plans of) the Leader. Those folks are the first to be nurtured & promoted, and they ultimately become tomorrow’s Leaders and enjoy the success that comes from that. This Book explains the steps involved in effective “Followership.” I’m buying copies of this Book for my entire staff. *Mark Kaplan, Chairman of Great Wraps, Inc.
Creative Followership: In the Shadow of Greatness” is a powerful must read book for everyone. It is not just another book on leadership, Jimmy Collins take a new approach and provides you a roadmap to be a successful leader by being an outstanding follower. I know Mr. Collins personally and his stories and years of life experiences makes these Biblical principals and applications come to life no matter what phase of life, or your career, you are in. I remember Mr. Collins saying that corporations and businesses don’t fail, people do. This exciting and fast read book will help you be successful in your personal and professional life. Jimmy…thank you for sharing your wisdom and insight with us on “Followership”…great book for high school/ college graduates too! I know I plan to share a few copies with our leadership/management team at NASA. Thank you for sharing your personal stories and life applications with us. Get your copy today! This is a great read that is inspiring for anyone, but especially those just starting out in the business world. Jimmy shares practical and wise principles he has learned from his personal journey as a follower of Jesus Christ in life and in business as president of Chick-fil-A. I have read the book and really enjoyed the great personal stories and practical Godly wisdom he offers to others to learn and grow from. 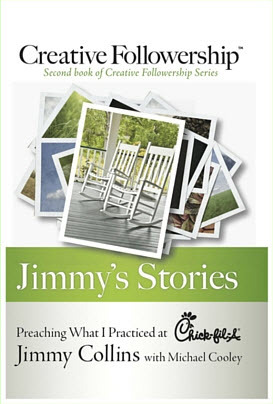 Creative Followership, a book written by Jimmy Collins, former President of Chick-fil-A, is a collection of sound principles learned and practiced by the author during his life and career. Now these simple principles and down to earth wisdom are shared in print and are available for all current and aspiring business leaders to emulate and put into practice on the road to a successful and fulfilling career. I highly recommend you take the time to read and learn from his example. Ken Williams, V.P. Real Estate, Waffle House, Inc. I have had the blessing of working with the most respected names in Hollywood from President of Warner Bros. Distribution to actors such as Kirk Douglas. I recommend Jimmy Collins book to any person who is chosen or gifted to serve in such a position. You will learn to embrace the book, and its wisdom! Creative Followership is hard to put down once you crack the cover! It’s an interesting and inspiring work. The book documents the life of a successful Christian businessman–Jimmy Collins, and provides numerous applicable principles gleaned from his rich life experiences. I recommend this work for any professional, at any level of responsibility, in any organization. For nearly 30 years of my life I’ve had access to one of the brightest, integrity filled, and wisest people on the planet, Jimmy Collins. 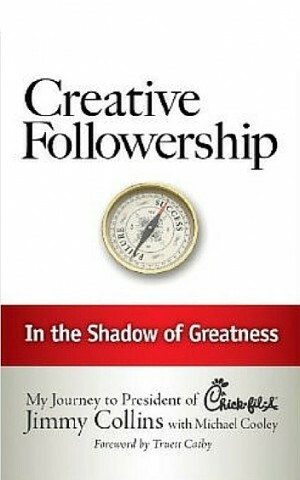 The great news is that you too now have access through his new book, Creative Followership. I would highly suggest you tap into this man’s insights and see why S.Truett Cathy made him the President of one of America’s great companies, Chick-fil-A. Learn and be blessed by one of the best “Level 5 Leaders” I’ve ever known!